Cody is 7 years old. He is a Malamute mixed, most likely with Alaskan Husky. We adopted him from the SPCA (San Francisco) as a rescue dog in 2003. 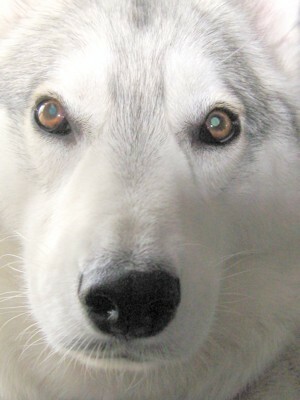 He likes to chase gophers (never catches them); play tag when he has the energy; howl as if he is talking with us. He is a dear friend to my wife and myself. He recently tore his cruciate ligament in his left back knee. We hope this is only a partial tear. We are seeing a orthopedic vet in a few weeks (high in demand and hard to book).